Become a Member! 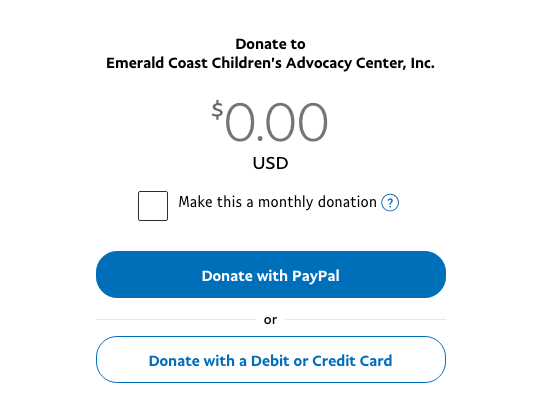 The Emerald Coast Children's Advocacy Center accepts credit card donations online. We sincerely appreciate and need your support. The best way to donate is to become a Member of the ECCAC. Clicking on this image will take you to the paypal site where you can donate with paypal, credit card, one time or monthly donation. Download a pdf of the recurring gift form here. What is planned giving? A planned gift is a charitable gift that is integrated into your overall financial and estate plans. Planned gifts can provide tax savings to you and your estate while giving a significant gift to the Emerald Coast Children’s Advocacy Center. Contact Chelsea Fox at 850-833-9237 x256 or email chelsea@eccac.org. IRS Form 990 for the Emerald Coast Children's Advocacy Center may be found by clicking here. The Emerald Coast Children's Advocacy Center does not share donor information with outside parties. Please complete this Outside Event Application Form by clicking here and send to Chelsea.